My five year old and I went on Sunday afternoon to catch the Mirvish production of Dr Seuss’s The Lorax at the Royal Alexandra Theatre. My wife and I love this story and its environmental message, and all three of us have delightedly watched the 1972 version on YouTube a number of times. 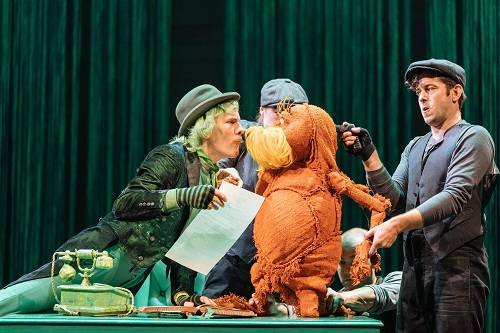 Now Mirvish has imported a production directly from the Old Vic Theatre in London, England, complete with music and puppets, to bring Dr Seuss’s incredible imagination alive on stage. One of the things I appreciate about this re-imagining of the story is that it gives the Once-ler, played by Simon Paisley Day, a credible motivation from the outset. His family is poor and they have no time for dreamers such as him, so they kick him out, giving his bed to Small Ed, played by Michael Ajao. So when he finds a chance to make money and prove his worth to his family, he does so despite the warnings of the Lorax, wonderfully puppeteered by Laura Caldow, Ben Thompson and David Ricardo-Pearce. Despite their uselessness, the Once-ler successfully markets the Thneed as “a Fine-Something-That-All-People-Need!” (In case you weren’t aware, Dr Seuss both makes up words, and rhymes a lot). Soon the Once-ler starts accumulating wealth, his family comes to work for him, and he sets up a factory and a town that becomes a city. The Truffula forest is cut down, and environmental devastation ensues. In this scenario, the Once-ler is a sympathetic character, before he succumbs entirely to greed, urged on by his family to “bigger” his factory, his production of Thneeds, and of course his money (which everyone needs). He even signs a contract with the Lorax to limit his business’s ecological footprint, but a band of unscrupulous singing lawyers agree with his family and enable him to rip up the contract. These additions not only lengthen the show to over 2 hours, but also expands on the original’s implicit critique of capitalism. The lawyers ripping off their robes to show shiny pink fringe dresses while performing impressive vocals in a soulful glorification of avarice was one of my favourite parts of the show. My son’s was the Super Axe Hacker, a machine that can chop down swaths of trees at once. It’s like a jacked up motorcycle with a propeller and six axes wielded by dancers, driven by Small Ed, who has become the Once-ler’s personal assistant. The Once-ler himself stands atop, singing the Super Axe Hacker song, which my kid hummed all the way home while pretending to chop down any pole that dared to be on the sidewalk. (I’m not sure he really got the message. We’ll work on it). Another standout number saw Small Ed — Michael Ajao is an amazingly energetic and skillful performer — do a turn as a DJ and rapper at a frenetic fashion show that displayed all the new uses for Thneeds. This scene mocked that pumped-up aspect of commercialism while also showcasing some wonderful dancing. There was even a banana. I think all children, and probably most adults, love a dancing banana. The rest of the songs, I’m afraid, are forgettable — or at least I’ve forgotten them. I will remember the gorgeous art design that brought together set, costuming, props and puppets into meaningful and visually striking colour palettes. The Once-lers and their things — including the pollution spewing factory — are shades of green, while the Lorax, and his animals, the Swomee-Swans and Bar-ba-loots, are shades of brown, yellow and red. The Truffula Trees, which descend from the ceiling and can grow larger or smaller, are vibrant shades of various colours including pink, purple and blue. The Swans are portrayed both by dancers and by puppets that soar through the air propelled by puppeteers below. The Lorax is the main puppet of the show — it is named after him — and has three people working together to bring him to life. I appreciate them all, but give special kudos to the one who spends most of his time scampering about on his knees, moving the Lorax’s feet. This is a great show to bring the family to, and hopefully it will spawn many conversations regarding what we can do about the environment. Especially with the children who will, of course, inherit this damaged planet.